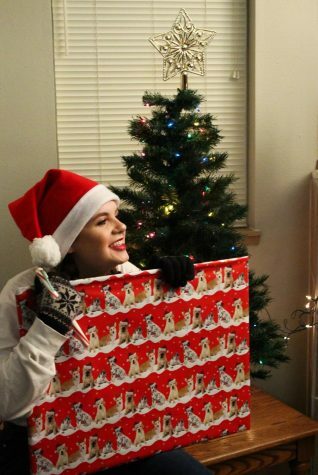 This columnist spent only $60 to achieve this festive-looking nook for her small apartment, proving that any student can do it. Thanksgiving has come and gone, so it’s finally acceptable for those of us who start to celebrate Christmas at the very beginning of November to bring out the stockings, lights and Christmas trees. It’s quite difficult, however, to get into the holiday spirit on a budget in a tiny college apartment, especially in a small town like Pullman where options are limited. Here are a few festive decoration tips and tricks that won’t break the bank or mess up the functionality of your living space. For those of us who celebrate Christmas, the most important decoration likely becomes the centerpiece throughout the whole month of December —the tree. We have countless decisions to make when searching for the right tree — do we go real or fake, full or mini, pre-wrapped or DIY? Larry Woodbury, owner of the Woodbury Tree Farm in Moscow, said he is an advocate for live trees because they have a significantly lower carbon footprint when compared to fake trees. Picking out and cutting your own live Christmas tree is a great memory-maker and tradition many families and groups of friends do every year, Woodbury said. Both on- and off-campus college students face some hurdles as they consider a real tree. Landlords and dorm residential education directors may need to OK the tree ahead of time. Because of the small spaces many students live in, they may not have many options for where to place the tree. For example, it’s not safe to put a live tree in front of a heater. As long as it’s far from all heating equipment and kept watered, the pine will make the apartment smell great throughout the whole holiday season and add an extra festive touch. The Woodbury Tree Farm, 3123 W Twin Road in Moscow, is open from 3-5 p.m. Monday through Thursday and 9 a.m. to 5 p.m. Friday and Saturday until Dec. 22. All Christmas trees are $50. Unfortunately, a tree that looms in one corner of the room can make the rest of it feel small and crowded. One way to remedy this while adding more holiday cheer is by draping a few strands of white Christmas lights around the remainder of the room. Many of us hardly have the income to supplement our decorating habits. Except for my Christmas trees and lights, all the decorations I used to dress up my living room were purchased from the Dollar Tree. Dollar stores are full of seasonal decor throughout the year, including huge winter holiday sections during the season. I went in with $22 in my bank account and left with a full basket and a decorated living room — all without spending even half my funds. I found hangable stockings in a variety of designs, countless ornaments, tree toppers, Christmas candies and other mistletoe-clad items. Make these holidays jollier with simple but nostalgic decorations that brighten a small space. Celebrating on a budget, though, isn’t the only important part of the holidays. 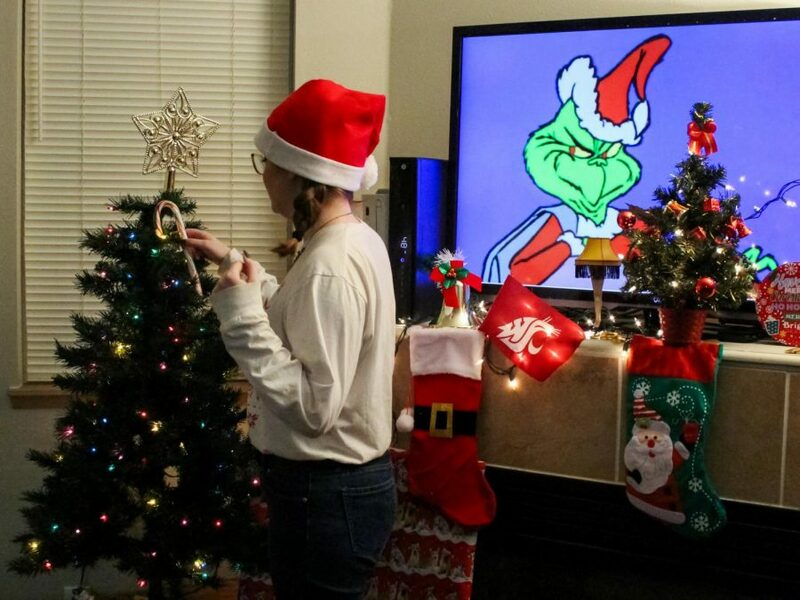 The advisers at Edward R. Murrow College of Communication’s student services decorate their office every year to help make students feel more at home while at school during the holiday season, Director Sara Stout said. Stout recommended putting out decorations that remind you of happy holiday memories because they can make the season feel more special. Stout said too many unmatched decorations slapped together crowd a space and look gaudy, and I wholeheartedly agree. In small spaces like apartments and dorms, this can be a trap many people fall right into. To avoid making your space look like Santa and all his elves had free rein, decorate sparsely with pieces you love. Find a great tree in your price range, find some lights to brighten the room and some other festive pieces that make you happy and don’t clash. Your space will be festive, your bank account will love you and your decorating style won’t mimic that of your grandmother’s.